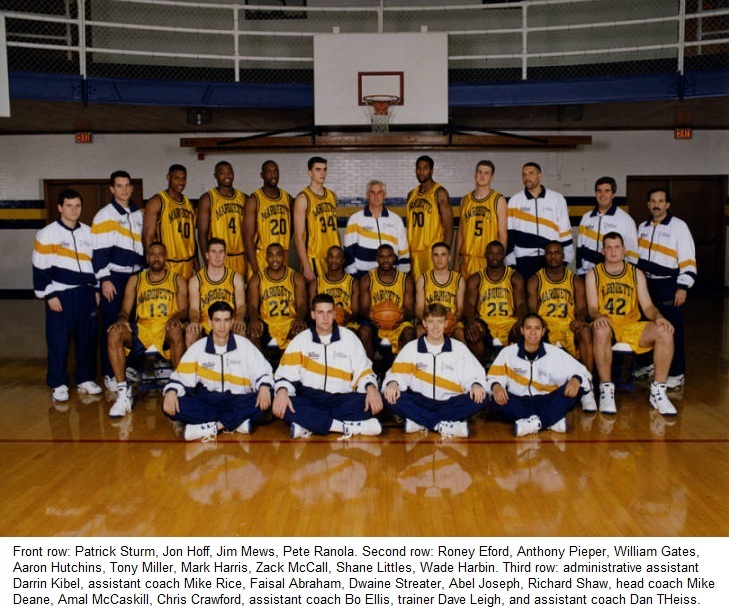 1994-95 marked a season of transistion and change for Marquette with a new head coach in Mike Deane and the Golden Eagles replacing the Warriors as the new nickname and logo. Kevin O'Neill didn't leave the cupboards bare, as Deane inherited five players (and one incoming recruit) who would finish their careers as 1,000-point scorers (two of which would go on to the NBA). Marquette jumped off to a 6-0 start, only to falter to as low as 12-10. They then bounced back to win eight of their last nine games to finish with a 21-12 record for the season, including 7-5 in the Great Midwest Conference. Despite the team's inconsistent offense, the Golden Eagles were carried by their resounding defense, which held opponents to just 38.2 percent from the field. Tony Miller, who Coach Deane considered the defensive player of the year, provided excellent defense on the perimeter, while Amal McCaskill and Faisal Abraham assisted inside. Offensively, Deane's first year at the helm was a “three for all,” as Marquette set a school record for three point attempts with 703 shots. Junior Roney Eford led the team in scoring with 436 points and a 13.2 average. Sophomore Anthony Pieper finished a close second with 431 points and a 13.1 average per game. Tony Miller and Amal McCaskill finished with 356 (10.8) and 354 (10.7) points respectively. Marquette faced only two ranked opponents all season, defeating both UW-Madison and Cincinnati. Auburn's Lance Weems jacked up 11 three-pointers (a record for an MU opponent in the NIT), but Marquette rallied to beat Auburn in the NIT opener. Anthony Pieper went 10-16 from the foul line in the second round game against St. Bonaventure (both MU NIT records) as Marquette advanced triumphantly to the third round. The third round game against South Florida was held at the MECCA rather than the Bradley Center, which evoked memories of past victories including the 25th anniversary of the last time Marquette took the NIT championship under head coach Al McGuire. Coach Deane also brought back Dean Meminger, the MVP of the 1970 tournament, for an inspirational pep talk. USF's Chuckie Atkins took 11 three-pointers (an MU NIT opponent record) and regulation time ended with a score of 43 apiece. Marquette was up 51-50 with 13 seconds to go when freshman Aaron Hutchins drained a three pointer to nail down the win. Roney Eford added a last second lay-up and a free throw to make the final score 57-50 as the loudspeakers played “New York, New York”. Tony Miller finished the game with 12 assists and Amal McCaskill added 15 rebounds and three blocked shots, all MU records for an NIT game. Penn State knocked down 11 three-pointers, behind five from Dan Earl (both records for an MU opponent in an NIT game), but Marquette's powerful shooting pulled them through over the Nittany Lions in the semi-final at Madison Square Garden. Marquette tied a school record (and set an NIT record) of 15 three pointers, as they rallied after trailing by as many as 16 points. Aaron Hutchins dumped in 20 and Anthony Pieper posted a career high of 32 on seven of nine shooting from long range, as Marquette shot a blistering 68.2% from long range (all MU NIT records). Amal McCaskill also tied his MU NIT record with three blocked shots. The NIT final against Virginia Tech went into overtime. Pieper hit a lay-up with eighteen seconds remaining to give Marquette a one point advantage. However, with 0.7 seconds on the clock Virginia Tech's Shawn Smith drew a shooting foul and made both free throws for the 65-64 victory. Virginia Tech's Shawn Good tallied four steals against Marquette and the Hokies shot 60% from three-point range (both NIT opponent records). McCaskill did tie an MU NIT record with 15 rebounds in the final game. Dec 31 #19 UW-Madison W 80-65 8-1 Marquette set a Bradley Center team record for rebounds with 63. The Badgers also set a Bradley Center opponent record for rebounds, with 54.